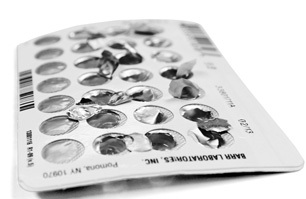 Birth control pills are endocrine disruptors taken intentionally. Endocrine disruptors (EDCs) are a group of substances, often synthetic, with possible harmful effects on the human endocrine system. Of particular concern are those which disrupt estrogen, androgen, and thyroid hormones. Hormones are the body's natural chemicals that regulate growth, behavior, reproduction, metabolism, etc. EDCs may interfere with the amount the body makes, block the way they are made, or mimic a hormone and send the “wrong” chemical signal. Some EDC-containing drugs are given intentionally (such as birth control pills). But these and other EDCs, including common product ingredients and industrial wastes, can also enter water supplies. Ingredients of some pharmaceuticals (like birth control pills). Many everyday items contain EDCs: some plastics, toys, metal can linings, flame retardants, cosmetics, pesticides. Exposure to EDCs can occur through ingestion of contaminated water or food, breathing the products of industrial or waste combustion, or even ingestion of some plant foods containing natural EDCs. The Water Quality Association (WQA) has noted that EDCs are among the “emerging contaminants” expected to be regulated in coming years. While no product performance standards have been developed yet, many point-of-use technologies have proven effective for some of these emerging contaminants, according to WQA: nanofiltration, reverse osmosis, activated carbon, distillation, ozonation, and advanced oxidization.